Did you know that it doesn’t take much space to grow a hearty amount of your own food? You don’t have to have a few acres in the country to have a big garden. Gardening doesn’t have to mean hours slaving in the hot sun to weed and care for rows and rows! No matter where you are, you can start growing more of your own food. 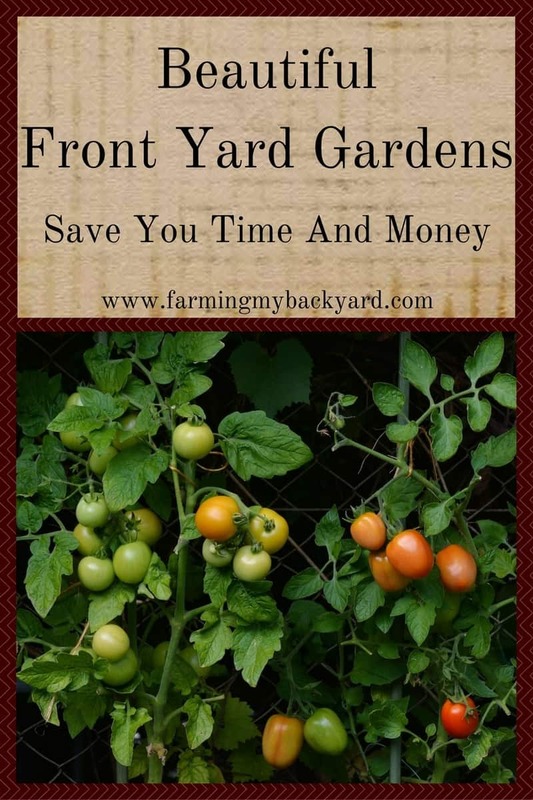 Even if you don’t have a large lot, it’s possible to utilize the space that you do have wisely in order to grow a respectable amount of food with a small investment of time. For many of us, front yard gardens are the secret to producing more of our homegrown produce. Having a beautiful and useful front yard garden requires thoughtfulness and planning. 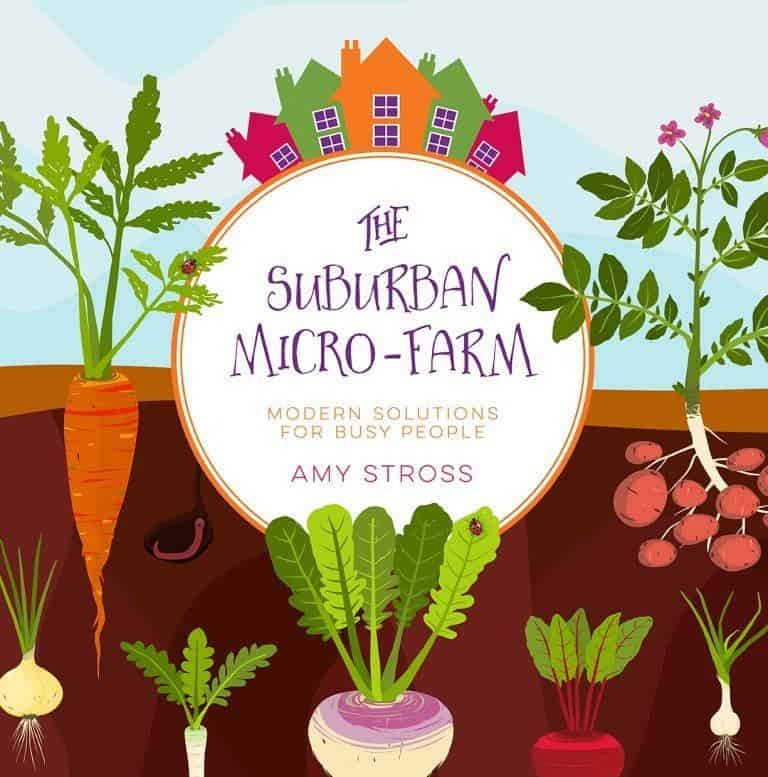 One of the best resources I have come across is The Suburban Micro-Farm by Amy Stross. She graciously sent me a copy to review, and I thoroughly enjoyed it. It’s been so popular that there is a full color edition coming out now! I slightly envy Amy’s beautiful front yard garden and love getting such a detailed explanation of how to create my own. When planning your edible garden to be stunning and unique it’s important to use landscape design principles when deciding what to plant. You can use principles such as lines and color schemes, just as if you were using ornamental plants. Make a fruit tree a beautiful focal point, especially when it blooms, or hosts colorful fruit. You can still use traditional vegetable plants even in the front yard, but choosing them with aesthetics in mind goes a long way to achieving a cohesive look. For example, a line of lacy asparagus makes a nice privacy screen. Fragrant herbs and edible flowers can absolutely excel in front yard gardens. Being strategic about which foods you grow increases your return on your investment. Perennial plants are an awesome choice because you buy and plant them only once, but they give you a harvest year after year. One of my favorite stories in The Suburban Micro-Farm is when Amy shares how they grew 27 pounds of cherries in one year from dwarf trees planted in their parking strip! She also discusses how berries can be especially economical. Berries are one the most heavily pesticided crops. Buying organic can be expensive, but planting your own is a great way to streamline your food budget. If you frequently use fresh herbs in your cooking, a culinary herb garden will save you plenty, and a medicinal one will also earn its keep. Most of us know to harvest rainwater to use in the garden. Rain barrels are a great way to do this, but it’s also possible to store enormous amounts of water right in the ground. By creating swales, earthworks, and rain gardens you can reduce your reliance on city or well water and increase the quality of your property’s soil. And if even if you are short on space, it may still be possible to grow crops for market if you pick the right ones. Even small spaces can produce a surprising amount of mushrooms, garlic, heirloom vegetable varieties, seedlings and cuttings. 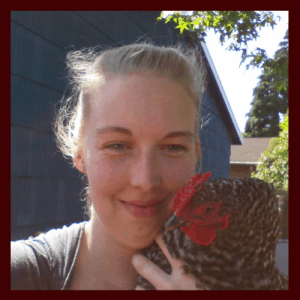 If you’re not sure how to get started with rainwater harvesting, or earning money on your micro-farm, Amy dives further into those topics in her book. One of the most daunting aspects of trying anything new is the amount of time we guess must be involved. You might have been drafted into weeding duty as a child, which maybe for some of you meant hours of your precious Saturday mornings. Or maybe you’ve never gardened before, and you honestly have no idea where to start. It’s okay to start small! Just one raised bed is the perfect beginning. Getting organized will help you utilize your time even if you already have a garden. Also, if you take advantage of perennial plants, companion planting, and plant guilds, your workload in the garden will steeply decrease. Let nature do all the work for you. One of the tips in the book is to plan on getting outside for fifteen minutes a day. It’s even better if you can split that time up into two segments. In the morning, take a walk through your garden and note the things that need attention. In the evening, spend a few minutes to harvest and address anything you noticed during your walk. I’m absolutely terrible at remembering to harvest things once I plant them. In fact, just this morning I went outside and found a butternut squash sitting in the middle of my front yard garden. The vines had died around it and was overgrown by the cover crop. Somehow I missed this little squash because I wasn’t walking through it daily. Doing some reading is a great place to start before you plant your front yard garden. It helps to have a plan and an example. That way you can avoid the mistakes others have already made. The Suburban Micro-Farm is a good place to start. If you don’t even have land yet, you can still start preparing yourself. Learning how to harvest and preserve foods by joining a CSA or a community garden. If you have just a patio try a container garden. You can even grow microgreens inside. Think creatively about the space you do have, and start looking for plants that will thrive. There are delicious plants that will grow in full shade, even if you don’t have very much sun. Amy includes lists of plants that grow in different conditions, as well as instructions for growing on steep hills. You don’t have to have the perfect spot! If your soil is less than great, start amending it with lots of compost, organic matter, and mulch. Start a small front yard garden. Start learning and reading how to excel. The most important thing to do is start growing. Great ideas! We planted 3 fruit trees in our front yard and love it! We also planted 2 berry buses and a lot for the pollinators. Great combo! Awesome! I love our raspberry bushes and pear tree. Great post and ideas ! that this spring the tomatoes are going out front in the full sun and right along the foundation edge. We’ll make good use of the space and free up a whole 5′ x12′ bed for other plants. Sounds like a great plan! Tomatoes stay leafy and green all season, so they should look rather cheery out there. I had accidental edibles in the front yard from the compost. I have pumpkins, lots of tomatoes and spaghetti squash growing amongst my herbs and wildflowers! It worked out quite nicely although I think I would prefer berries and currants in the front to squashes!